I had a very enjoyable Saturday last week and it wasn’t because of a scrumptious meal at a promising new restaurant or a cool shopping find. It was a simple but memorable four hours in a kitchen with an extraordinary lady and no, I didn’t do the cooking. That short amount of time was spent listening to the lady as she told us her about her culinary escapades. We could see how passionate she was about cooking and how she takes pride in involving her whole family in the kitchen. To her, cooking is more than just putting food on the table; which is obviously something I can identify with. Both of us share the same cooking philosophy and I couldn’t help but be taken in by her enthusiasm. It didn’t take long for the energy level in the room to shoot up. This remarkable lady stood out because of her engaging and warm personality. She is none other than the ever so amiable Irene Jansen, someone whom I think is the equivalent of a local Jamie Oliver. She’s a cook with a selfless mission. She is keen to use her cooking skill to highlight the importance of family and family time. Besides, a family that dines together stays together don’t they? Entice your children with fast and delicious food she says, then they’ll eat home more often and spend time with you and best yet – they’ll bring home their friends for dinner and you’ll get to meet the people they hang with. Yep you get the whole idea. I must say it really does make sense. I found it quite refreshing, this outlook that Irene shared. You’ll be even more surprised to know that all this was communicated through a cooking demostration at Tampines Changkat CC conducted by her, under the PA Culinary Journey series organised by the company I work at. I was there to lend a hand and I’m glad I went. The theme was Iconic Singaporean Foods and not only did she teach the class how to make Dried Pesto Laksa, Iced Cheng Tng and Roti Jala with Chicken Curry, she instilled in them a greater purpose. That is, to bring cooking back into the kitchen! Sounds plain and simple doesn’t it? But here’s the reality – there are some families here in Singapore who are living on welfare and have insufficient funds and means to eat a healthy and nutritionally balanced meal. So what does Irene do? She approaches not-for-profit organisations and pitches to them a fantastic idea: teaching low-income families how to stretch their dollar and at the same time, nourish themselves with food that don’t cost much but are easy to cook and healthy at the same time. The entire idea on paper itself sounds easy. But the execution bit needs plenty of planning and organising and time. And does this deter Irene? Nope, it only spurs her on. She shared that it was crucial for someone to step up to the plate and do this. There’s no point thinking about it, sitting on it and not doing anything. So that’s how she started her company “Culinary Adventures“. Irene not only cooks, but gives dining tips on radio (93.8 Live and Gold 90FM). She is also a writer and food consultant. To me, Irene is a force to be reckoned with. Her down-to-earth approach to cooking makes her accessible to normal amateur cooks like you and I. This quote from her website only drives home that point – “My recipes use easy cooking methods, time-saving short-cuts and a few tricks – like my orange yoghurt cake made without butter to keep down the calories. But more than anything else, I cook from my heart to bring joy to family and friends. You’ll be amazed how rewarding that is,” says Irene. As someone who has never had any culinary training and had to learn how to cook and bake by trial and error, I totally understand where she’s coming from. When I started this blog, and began to cook and bake more, I picked out only the easy recipes because they seem less daunting. As with any new thing you learn, it does help to take baby steps before leaping into the deep-end only to find yourself lost in the whole complexity of the kitchen. It’s all about the process I guess. Start small, gain confidence and then tackle the bigger recipes. You are probably wondering what that is! Looks abstract, no? It’s not paint, that’s for sure. That’s how you get that ‘web’ or ‘net’ on that non-stick pan. Known as ‘roti jala’ (translates to ‘net pancake’), it is usually eaten with curry. The ones you see at Malay stalls are really yellow and chewy. That’s because they use food colouring and a relatively thick batter. 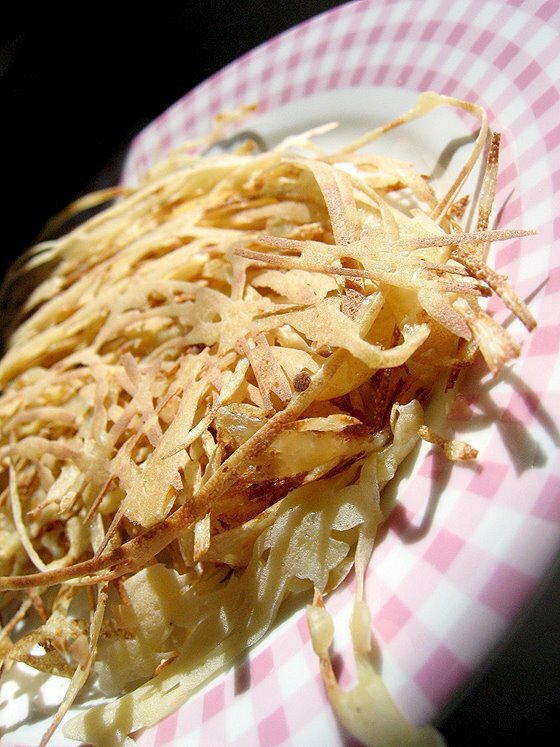 It looks like rosti yes? Oh, you would also need to get that yellow udder-like contraption that I placed above. That’s how you dispense the batter over the pan. Please ensure you don’t lift it too high. 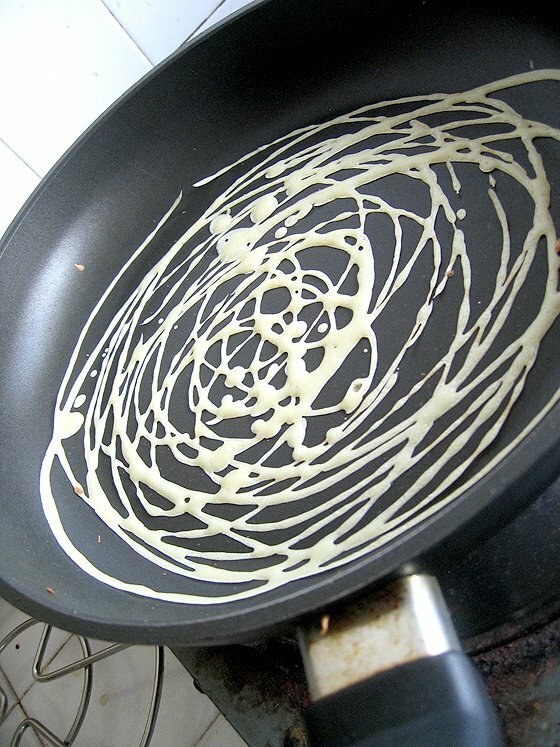 Have it closer to the plan and circle the batter around, creating a beautiful net without coating the entire pan. You want roti jala, not crepes. The entire class had alot of fun trying their hand at it. This was quite a hands-on class, which doubled the fun! I also took part in the fun and made some of my own. By the end of the class, I had mastered the art of roti jala and Irene gamely joked that I could be her roti jala girl at her roti jala shop if she ever opens one. I think roti jala would be perfect as a dessert too! I’m thinking of having it with ice-cream and bananas next time. Hmmm or perhaps some caramelised bananas? Anyway, the roti jala you see in this post was made using the left-over batter from the class and I would like to thank Irene once again for imparting her invaluable knowledge and sharing her aspirations. Oh and she was so sweet – she gave me the yellow roti-jala contraption so that I could use it to make more roti jala with the batter I brought home. I was really touched. 1. Mix flour, eggs, salt and water together until mixture becomes smooth. 2. Tie the pandan leaf into a knot, place it in the oil and spread over frying pan. 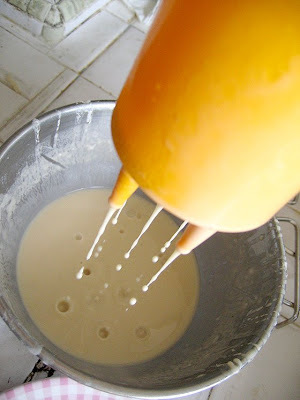 Repeat steps 2 to 4 for the rest of the mixture. Looks like chips! Something different! Ooooh, what fun! I’m certainly going to try that – thanks for the recipe! I know Irene on a professional level. Next time you MUST get her to sing! She not only can cook, she can sing very well too! Thank you for this! My grandpa used to make this for us, it was one of me and Sheena’s fav home-cooked things [aside from chappati and thosai which he also made]. I rarely see this in stalls/restaurants here. It is def GOOD STUFF. 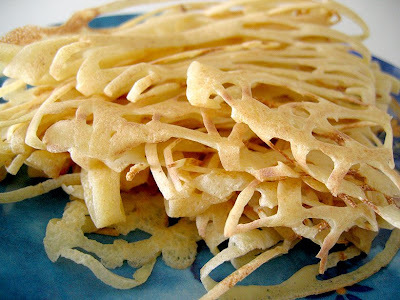 Btw, isn’t roti jala = net bread [vs. pancake]. 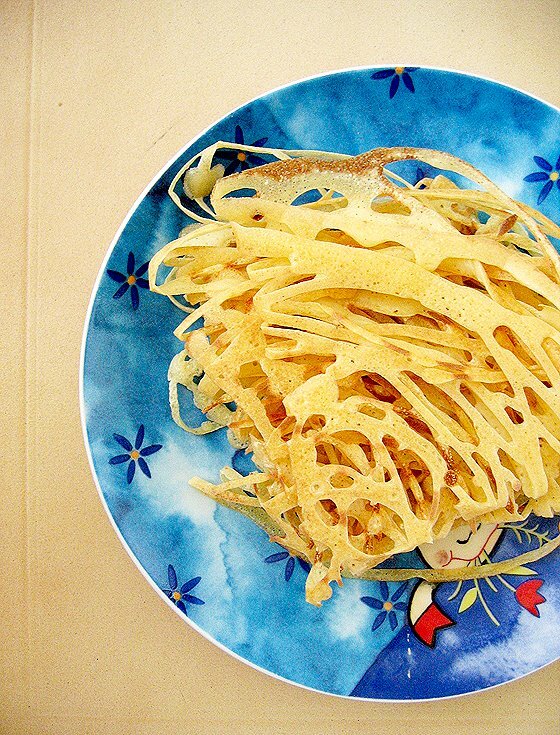 hi there, i love roti jala and would love to try this out. Any idea where the contraption can be purchased?